Former AOL Digital Chief and founder of startup incubator Launchbox Digital John McKinley’s mother fell ill recently and McKinley turned to the web to find answers on how and where to seek care for his elderly parent. McKinley found a distressing lack of resources that helped adults find the right care providers for elderly parents. 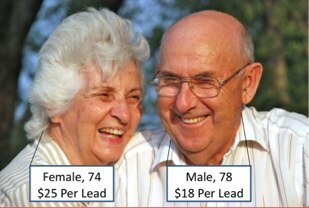 He found that many of the existing services were targeted towards the care providers instead of the consumer, with services often focused completely on making sales commissions off of connecting seniors with care facilities. And McKinley found that none of the existing services offered a user-friendly web interface to find customized care. McKinley vowed to create a portal aimed towards the consumer and today, is officially launching OurParents, a free elder care matching service, focused on assisting adult children with aging parents find the right care solution that meets the parents’ and family’s health care needs. OurParents’s transparency is derived from the site not making money from any matches that take place via the site. OurParents aims to provide an unbiased service that helps families sort through the decision of whether in-home care, a senior community, assisted living facility, nursing home care, or hospice care is best for their elderly parents. And the site does a lot of the fact-finding work for you. 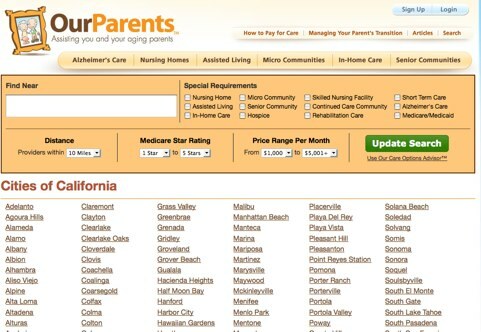 OurParents offers descriptions, services, photos, quality ratings, price info, etc. for over 65,000 care providers and allows consumers to filter search results by location, cost, quality, distance and special requirements. Among the site’s features that are particularly useful to consumers when assessing a senior care facility are free detailed reports about each facility, which includes access to the Medicare ratings, detailed audit findings, community data, and information about nearby hospitals and clinics. Users can also access provider information such as real life stories about a provider, news stories, bankruptcy filings and nursing home abuse allegations. OurParents includes a tool called the Care Options Advisor, that lets a person describe the circumstances about a senior citizen (health, age, priorities, etc.) in an entry form and be guided to the type of care options that make the most sense to consider. Once users pick a provider that they are interested in, OurParents will contact the care provider for the user. OurParents currently doesn’t advertise on the site but plans to make money from paid services the site plans to offer users in the future, including insurance and health related products. Enurgi, which was acquired by health care provider Univita earlier this year, provides a similar service, but Enurgi is targeted toward connecting the elderly with home caregivers, a small segment of the elderly care population. And Energi took a cut of transactions that took place via its site. 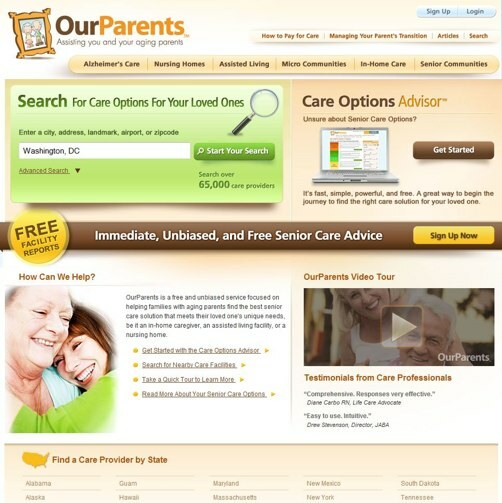 Because it’s completely free, OurParents is sure to be a popular destination for adults looking to find unbiased and detailed information on care for elderly loved ones.